Arguably, that divide is most conspicuous in the relationship between design and sustainability. By and large, architects still think of design as an art and sustainability as a science — and rarely do they come together. Eight years ago, Vanity Fair surveyed 52 of the world’s leading architects to identify the greatest structures built since 1980, and the resulting list revealed a conspicuous dearth of green buildings. In response, for ARCHITECT magazine I conducted my own poll of leading sustainable design experts to find the most important examples. Not a single building or American architect appeared on both lists. Standards of “good design” and “green design” seemed completely separate. The apparent rift continues today. For example, every year the American Institute of Architects selects a number of projects to receive the Institute Honor Awards for Architecture, “the profession’s highest recognition of works that exemplify excellence.” Since 1997, the AIA’s Committee on the Environment has also selected 10 projects annually to receive the COTE Top Ten Award, “the industry’s premier program celebrating great design and great performance.” The two honors essentially represent excellence in design and sustainability, respectively. Of the 220 projects eligible to have received both awards, fewer than 10 percent have done so, although signs suggest the overlap is growing. So, even in the best cases, designers often think of how buildings look as being separate from how they work. Yet, research shows that the earliest design decisions — size, shape, orientation, etc. — determine up to 90 percent of a project’s eventual impact. 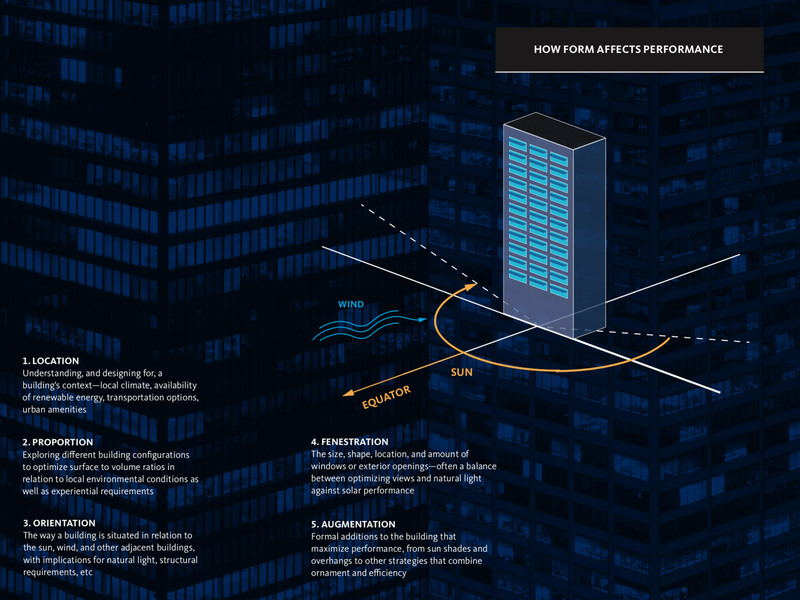 As we illustrated in Gensler’s 2018 Impact by Design report, there is a relationship between form and performance, image and impact. Much of our recent work demonstrates this as well. The twisted form of the LEED-Platinum Shanghai Tower bends with the wind to reduce the amount of structural steel by 25 percent and save $60 million in construction costs. 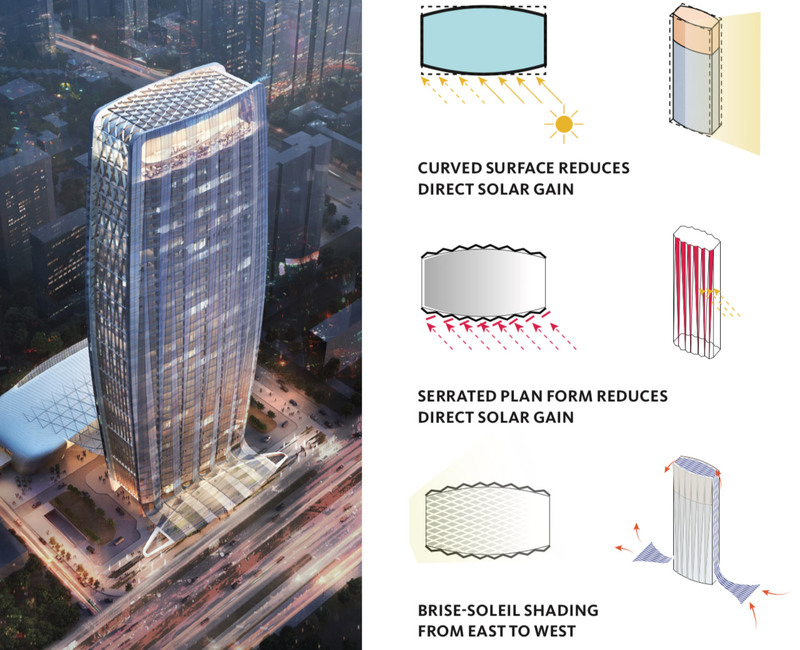 The curved, serrated façade of the CCCC Haikou Headquarters minimizes direct solar heat gain. For a student housing project we are currently designing, we found that by simply facing all the rooms south or north we could cut heat gain by 71 percent, a dramatic improvement in energy consumption, operating costs, and occupant comfort. The earliest design decisions determine up to 90 percent of a project’s eventual impact. Furthermore, as I study in my 2012 book, The Shape of Green: Aesthetics, Ecology, and Design, a growing wealth of research in environmental psychology and neuroscience is teaching us more and more about how people respond to shape, space, color, pattern, and texture — the designer’s toolkit. Some patterns have been shown to reduce stress by as much as 60 percent, just by being in our field of vision. If designers applied such knowledge to everything they touch — from products and interiors to buildings and cities — the entire built environment could both look good and be good for you. With more and more evidence of the power of architecture, can we finally take up Wilson’s call to action and usher in a new era of consilient design? This week at Greenbuild in Chicago, I will be exploring this question in a presentation with James Timberlake (KieranTimblerlake), Bob Harris (Lake|Flato), and Andrea Love (Payette). Come join the dialogue! Lance Hosey, FAIA, LEED Fellow, is a Design Director and Sustainability Leader in Gensler’s Southwest Region, based in San Diego. He has authored two books and hundreds of essays on design innovation for the New York Times, Washington Post, Fast Company, Huffington Post, and other publications. As of 2015, he was one of only 30 people in the world to be named a Fellow with both the AIA and the USGBC.